We've taken inspiration from classic 60s style and channelled the spirit of Steve McQueen's Bullitt for this fine-gauge Roll Neck. Crafted from luxurious merino wool, it is exceptionally soft and lightweight. While Sunspel played a pioneering role in the development of some of the earliest cotton underwear and t-shirts to ever be made, our occupation with wool pre-dates all of this. Woollen underwear was one of the very fist products to be made by Sunspel when Thomas A Hill founded it in 1860. In fact, despite the development of cotton undergarments and all of their obvious benefits, woollen underwear remained a mainstay of the business right up until the 1970s: a result of the English climate and some of our customer’s apparent desire to live with windows that never closed and heating that never heated. 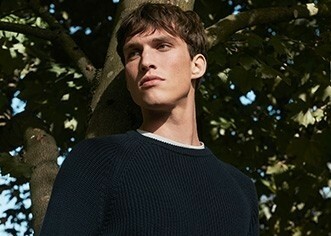 We make our roll neck jumper using a merino wool which is not only supremely soft, but strong and long-lasting. A timeless wardrobe staple: pair with jeans or chinos and layer under on of our blazers for effortless style.